Did China rescue Deutsche Bank? As we approached the end of September and entered October, the imminent demise of Deutsche Bank was on the lips of many insiders and the MSM alike. Then everything went quiet. And nobody was even commenting on the silence. It intrigued me. Even Zero Hedge went silent at the end of October, which raises who really runs it. Even Parkes’ own website doesn’t carry the story. Then tonight I was listening to Simon Parkes, who said that the Chinese had purchased 25% of Deutsche Bank. So, I went looking. The only evidence this might have happened that I could find is this article from October 9, 2016, raising the possibility that China could take this step. And the only thing I can say is SOMETHING has happened to save its skin, at least in the short term. You have no doubt heard by now about the precarious situation that Deutsche Bank finds itself in, including the impending US government fine for selling faulty mortgage-backed securities in the run up to the financial crisis. The lamestream media is busy running stories about German bailout rumors, and bank’s uncanny ability to not quite die…yet. But in case anyone is tempted to draw comparisons with the 2008 financial crisis, rest assured that the failure of Deutsche Bank would be no “Lehman Bros. moment.” It would be incomparably worse. 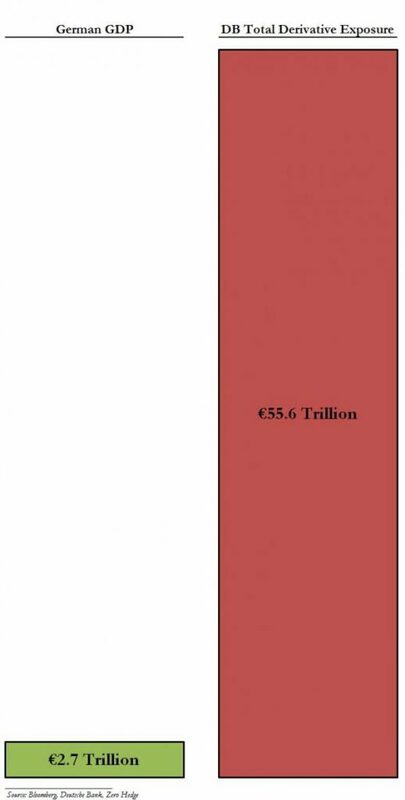 …Well, in 2013 its notional derivative exposure was 55.6 trillion euros. Let’s put that in perspective with a graphic from ZeroHedge comparing DB’s derivative exposure to the Gross Domestic Product of Germany. Does that look frightening? Well, don’t worry. Deutsche’s derivative black hole has been pared back to a much more modest 46 trillion or so euros, a mere 15 times German GDP. Does that make you feel any better? I didn’t think so. It’s not if with Deutsche. It’s when. 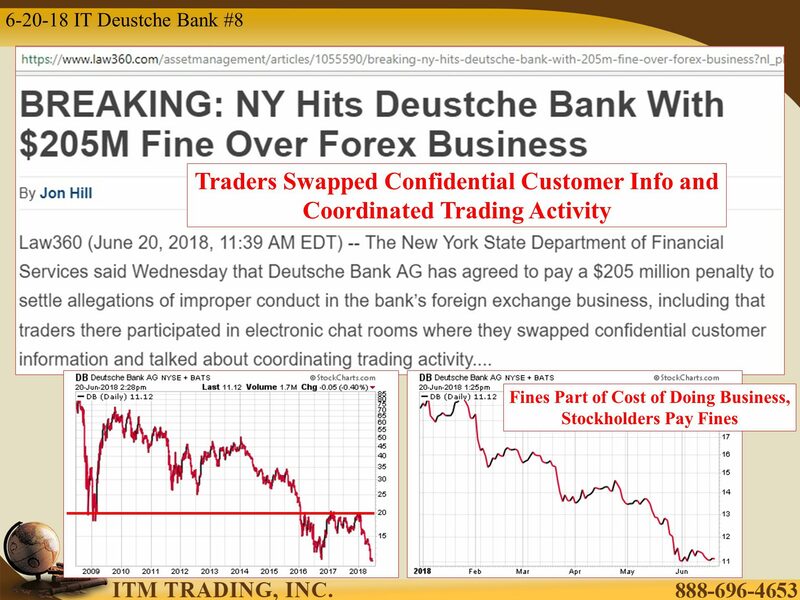 And the counterparties began to pull their cash out of Deutsche last week. Not long to go when that starts. Anybody who reads my posts will know I’ve been talking about the impending demise of Deutsche Bank for several months. When Citi’s note exposing DB’s undercapitalization came out, it had precisely zero impact on the price of DB stock. Why? Because as we said above, capitalization – and solvency – tends to be a largely worthless, pro-forma concept. 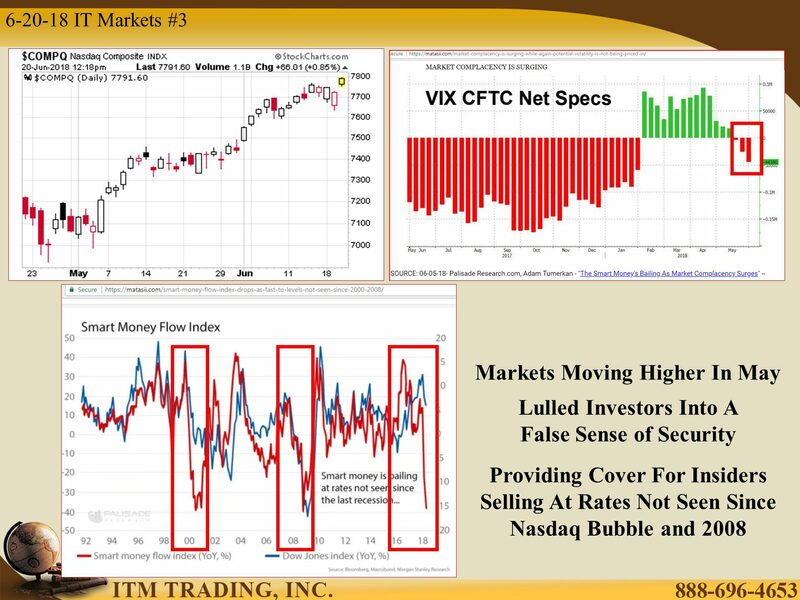 However, when Bloomberg reported today that select funds have withdrawn “some excess cash and positions held at the lender” the stock immediately plunged: the reason is that this had everything to do with not only DB’s suddenly crashing liquidity, but the pernicious feedback loop, where once a source of liquidity leaves, the departure tends to spook other such sources, leading to an outward bound liquidity cascade. Again: just ask Lehman (and AIG) for the details. Which then brings us to the $64 trillion (roughly the same amount as DB’s gross notional derivative exposure) question: since DB is suddenly experiencing a sharp “liquidity event”, how much liquidity does Deutsche Bank have access to as of this moment, to offset this event? The answer would allow us to calculate how long DB may have in a worst case scenario if we knew the rate of liquidity outflow. Deutsche Bank stands at the center of the European financial system – it is a major counterpart of all relevant European banks, and broader. Recent reports of potential litigation hits have compounded capital concerns, and raised the overall level of market anxiety. “Crisis” questions are being asked: “is there risk of a financial crisis re-run” and “can a large European bank face a liquidity event”? So what is the answer: how much liquidity does Deutsche Bank have access to? The answer is two fold, with the first part focusing on central bank, in this case ECB, backstops in both $ and €. In line with that Chinese proverb; we live in interesting times. In the light of all of this, you might want to watch Jim Rickards and Egon von Greyerz discuss 10000 gold. Is this the thin end of a very large wedge? Now, none of this is new. The impact of Zero Interest Rate Policies (ZIRP) on creditors is self-evident. So, is part of the ZIRP plan to effectively destroy the main street banks, again as part of the move to a new global “lifesaving” currency? I wonder if it’ll hold together until the Shemitah date of October 2nd? If you use the Lehman Brothers graph is a predictor, it’s almost bang on target. The fallout of Deutsche Bank’s failure will be hard to imagine and impossible to contain. An investigation of Deutsche Bank’s “Passion to Perform” balance sheet provides the clues. The above clip from Deutsche Bank’s First Quarter 2016 Statement. Details in red from page 61 (PDF page 63) of the 126 page report. Zero Hedge commented on the World’s Most Systemically Dangerous Bank. Deutsche Bank’s price to book value is 0.251. Effectively the market suggests Deutsche Bank is worth 75% less than book value. Why? Brexit is the easiest explanation to throw out. Share prices started collapsing a second time starting at the beginning of 2014. The bank has always been heavy in derivatives. Although recent activity may have led to losses or more scrutiny, it’s relatively easily to discard that as the primary answer. Instead of pondering the obvious problems, what about other things? Rising chance that Eurosceptic leaders take control of Italy. What if Eurozone intrabank balances are in question? My best guess is that Deutsche Bank share prices reflect all of the above but something in the second set of reasons, or something we still do not fully understand is the primary reason behind the collapse. 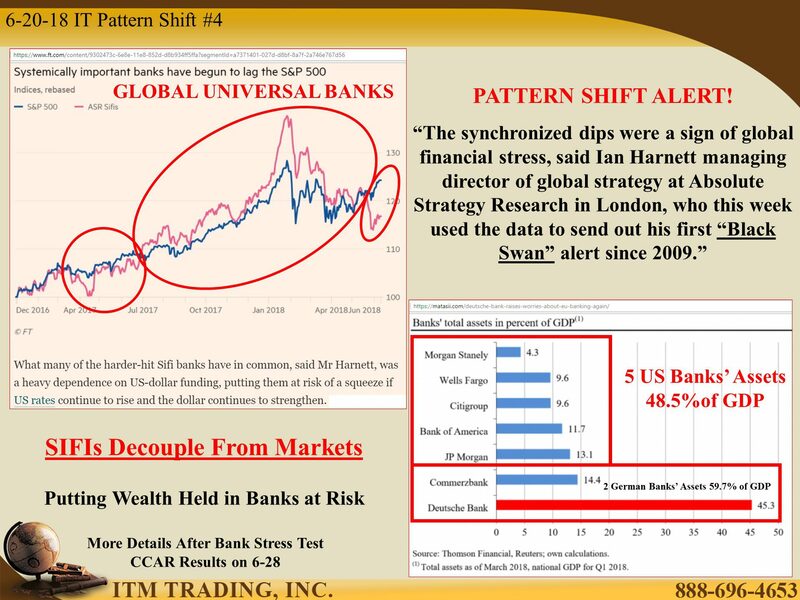 Over three years ago we wrote “At $72.8 Trillion, Presenting The Bank With The Biggest Derivative Exposure In The World” in which we introduced a bank few until then had imagined was the riskiest in the world. End of quote, though the rest of the article is worth reading. 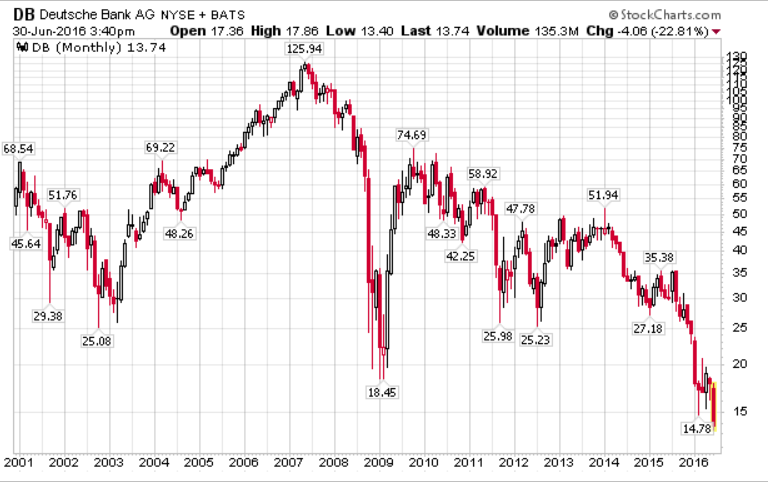 Watching Deutsche Bank over the last few years has been like watching a train wreck unfolding in slow motion. It’s risk appetite on many levels has meant that it’s failure was only a matter of timing. And let’s not forget who the IMF is. Like the World Bank, the BIS and others, they are tools of the Jewish global banking elite, posturing as good guys when that’s the last thing they are. And, also, let’s remember the Economist – a recognised Rothschild mouthpiece and used to foretell future events – had a cover a couple of years ago predicting a new global currency in 2018. I’d say they’re right on track. We don’t have long to change the rules on them – or have events unfold in our world that achieve that end. I see a couple of candidates. Despite major jawboning and bond-buying by The ECB, Deutsche Bank’s “see it’s not Lehman after all” dead-cat-bounce has officially died as the giant German bank’s stock collapses back near record lows. We know where the Lehman scenario led us; the 2008 GFC. THE WICK HAS BEEN LIT: How Long is the Fuse? I have discussed several times the exposure that Deutsche Bank represents to the global financial system. In truth, it ran out of track in 2016 but was rescued by mostly Chinese money. However, this exposure is not going away and in this video, Lynette Zang discusses in detail the state of Deutsche Bank and its implications for the global financial system. The collapse of Deutsche Bank will not be the trigger. As with the flapping butterfly wings theoretically creating a hurricane (chaos theory), no-one knows what the trigger will be. It will only be spotted in hindsight. Nor when the trigger will come. But we can confidently say that Deutsche Bank will be the financial tsunami that will sweep the entire current financial system away, ignoring such minor things as the US bond market implosion that has begun. Investors have not yet begun running en masse for the exits, triggered by increasing bond market interest rates, but that time is not far away. Many eyes are watching for the 10-year US bond interest rates to exceed the 30-year interest rates, technically called an inversion. This is considered a sure sign of a coming economic downturn. That moment is not far away. And what awaits us is a financial event we have never experienced and perhaps the world has never experienced. It will be a global financial reset. Have you prepared yourself? Personally, I agree with Lynette’s precious metal advice.